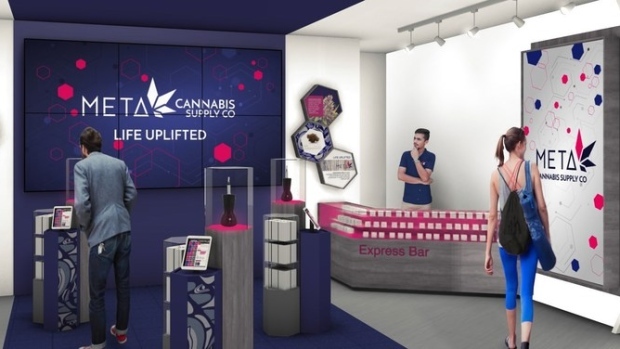 A rendering of a Meta Cannabis Supply Co retail location , Handout photo courtesy of National Access Cannabis Corp.
Second Cup’s cannabis retail partner has released new details on what its in-store presence will look like. 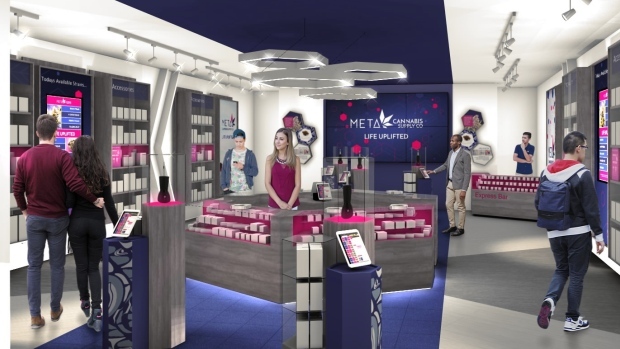 National Access Cannabis (NAC.V) announced Tuesday that the stores to be opened in existing Second Cup locations will be called Meta Cannabis Supply Co. The coffee chain made its plans to partner with NAC public on Apr. 12. Second Cup (SCU.TO) Chairman Michael Bregman told BNN Bloomberg in April that the coffee chain’s branding will not appear in the dispensaries and the marijuana products will be NAC-branded. “With strong First Nations and Licensed Producer relationships in addition to our exciting strategic alliance with Second Cup in prime retail locations, NAC is set to develop a broad retail network across Western Canada,” NAC CEO Mark Goliger said in the release.